As if there were not already enough well known biodiversity reasons, I now have a very personal one to return to the Daintree rainforest. For three years, prior to early 2010, I had the good fortune to work in the Daintree for the not-for-profit conservation organisation, Rainforest Rescue, as their conservation manager. In addition to running their Daintree Buy Back and Protect Forever Project, I also looked after Rainforest Rescue’s Plant a Rainforest Project. As well as managing our own replanting project, my role included liaising with Daintree landowners regarding weed control and tree planting on private properties. With the help of local and overseas volunteers, Conservation Volunteers Australia and a Cairns-based group from PNG, we planted 20,000 young trees in the Daintree on a total of 16 properties by the time I left. All had been grown from the seeds of the many rainforest species we collected locally. Usually planting has to be done in the wet season as the Daintree can have pronounced dry seasons when freshly planted young trees may shrivel and die. It was very hot, sweaty, thirsty and at times wet work, but with plenty of enthusiastic volunteer company, always great fun. Not quite as much fun was the inevitable and demanding weed control that follows planting. Hot, humid wet season conditions and the good Daintree soils allow rapid weed growth, if given the opportunity, weeds can quickly overpower, smother and may eventually kill young trees. The majority of work in tree plantings is therefore not the actual planting itself, but what goes on over the next two years to ensure they survive the initial onslaught by weeds. After that they should be able to fend for themselves, although a final tidy up may be worthwhile after the start of their third wet season. 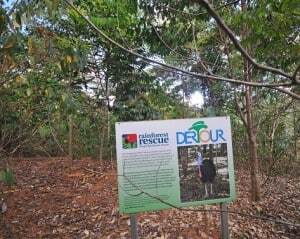 On my return recently, I found the Rainforest Rescue replanting and weed maintenance programme progressing well, now under the conscientious leadership of Joe Reichl, with all plantings continuing to flourish. The trees had grown so much, many to over 15 m in height, that they had now completely changed the appearance of the areas planted in as little as three years. One fairly typical example of this is illustrated by the accompanying photos. The only recognizable feature, in this instance, is the sign. The view from the road has been transformed from an ugly mass of guinea grass and Asian bramble in 2008 to the makings of a vigorous young and healthy rainforest. I find this tremendously satisfying. To top it off, in the process of visiting the rapidly growing trees, we gained great views of cassowary and buff-breasted paradise kingfisher. What a place! 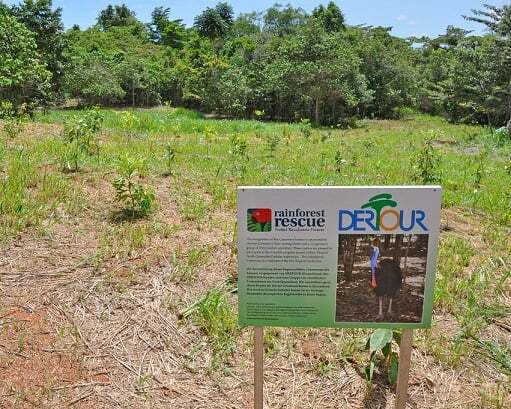 An exciting development since my time with Rainforest Rescue is that the Daintree Cassowary Care Group has transferred the management of their community-run tree nursery at Cow Bay to Rainforest Rescue. This means all the seedlings required for the Plant a Rainforest Project are now propagated in the Daintree by part-time nursery manager Edie Beitzel, helped by a great group of local volunteers. Eight of the 16 properties we planted can be seen fairly easily from the road, at the co-ordinates below. If you are heading that way, why not check them out? At three of these there is nowhere to pull over at the exact coordinates, so it’s best to drive on a bit, park and walk back. Remember some are private properties with restricted access, but can still provide good views from their property boundaries. 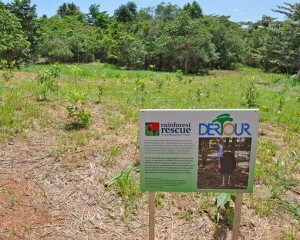 More information and opportunities to help may be found on the website: www.rainforestrescue.org.au. If you would care to assist, there remain more properties to purchase for return to nature and more weed infested areas to reforest.